The Skirted Roundtable: Kathryn M. Ireland Visits the Skirted Roundtable! We were thrilled to spend time talking with Kathryn Ireland, the interior designer, NOT the model who unfortunately has the same name! Kathryn is English but lives and works in California and summers at her house in France. Besides decorating, she also designs a fabulous fabric line. 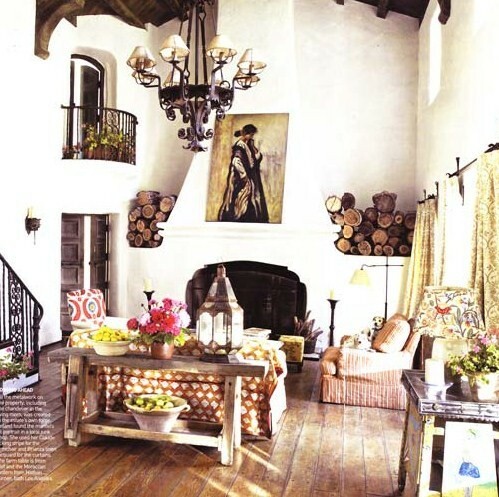 Her ranch in Ojai influenced the creation of her latest fabric line: Mexico Meets Morocco! Kathryn was so much fun - she was at home after a long day of work - and she was ready to relax and just chat. We talked about her wonderful house in Ojai that she sold to Reese Witherspoon, and we talked about her garage that she turned into her own private retreat after she sold her ranch. A lot of Kathryn's clients are famous - A-listers in Hollywood. She got her start partnering up with the actress Amanda Pays when they both owned a small shop. Steve Martin came in one day and bought up everything! The rest is history. This book tells all about the restoration of her Ojai Ranch. This book is about Kathryn's decorating style - with loads of pictures. Both are available on Amazon: order Classic Country HERE and Creating A Home HERE. A third book about her house is France is coming out soon. And for those in the LA area, Kathryn will be doing a book signing at Giannetti Home on Saturday. Check out Brooke's blog for all the details. We hope you enjoy listening to this interview! Coming up is Vicki Archer - the author and blogger who lives a dream life in Provence, and next, a surprise guest, a giant in the decorating field. We had a great response to our One King's Lane shopping spree giveaway! A big congratulations to Pam Gray of the blog Clustres who is the winner of a fantastic $200 shopping spree! We're all very jealous Pam! However, to make it up, our newest sponsor Hot House is offering a generous 30% discount to The Skirted Roundtable listeners at her wonderful Etsy shop, filled with amazing vintage decorative accessories and clothing. Just use the TSR1210 at checkout. Just in time for a little holiday shopping. I can't wait to listen! I own the Ojai ranch book and ate it up. I'm really close to Ojai and often wonder if I should go up there and stalk around a little bit to find it ;) Gorgeous gorgeous gorgeous!!!! I'm like Joni I cannot wait to see Katherine's book in April...thanks so much for this one ladies! From her photographs I always imagined Kathryn to be cool, calm, collected and reserved. What a vivacious woman. I can't wait for the new book on her French farm. Fun interview! Love Kathryn's sense of humor. Her books look wonderful...will have to check those out. I always love to listen your great interviews! It brings me so much inspiration! What a alive woman is that Kthryn Ireland! Hearing her speaks make me feel like i want buy all her books! I'm just catching up with the Skirted Round Table interviews, and I must say, Kathryn Ireland is a real pistol! What a vivacious, marvelous personality! This particular podcast made me feel I was in on the whole conversation. Loved the fact that you let her go on (although I would guess she's a hard one to stop!) and talk about whatever she wanted to talk about. One of the best you have done! This was my gift to myself to spend the time and and listened to that hilarious interview with Kathryn....isn't she a thrill to listen to? To hear her down to earth and fun way of thinking about life, decorating, family and friends... oh I loved it all. She's been around and one can tell!!! I've had Kathryn's Country Home book for a couple of years and recently got the other 2 after seeing her on MDD. Are her fabrics available to the public or to the trade only ?